Plants in the nursery cold frames are finally emerging as spring begins. 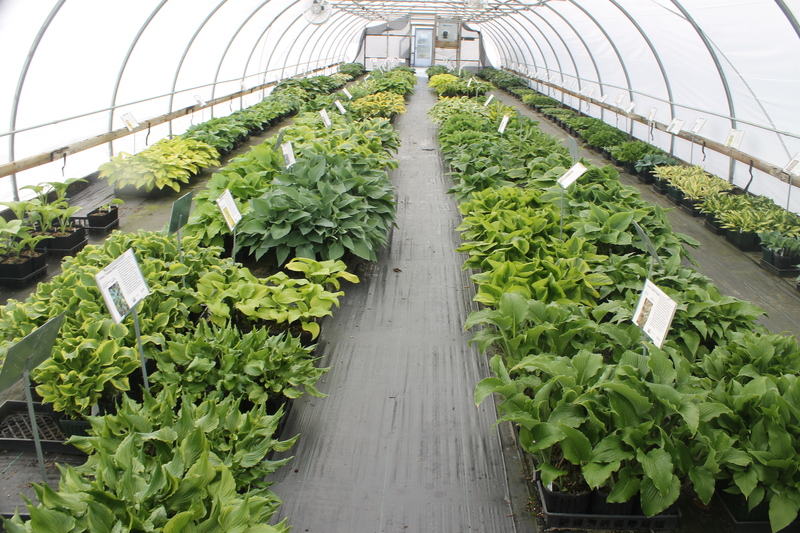 Here’s a new photo from one of our hosta greenhouses. If you’re used to receiving small, recently propagated hostas from other mail order companies, we think you’ll be pleasantly shocked at the size of our hostas. Hosta, Maidenhair Fern, _________________ – what is the plant w/the variegated foliage on the left? Please reply via email. Thanks! That’s Podophyllum difforme…one of our favorite Chinese mayapples. We are bulking this up to offer in a few years. You can plant hostas any time of year that the ground isn’t frozen, being sure to give them enough time to establish before any winter frost heaving could occur.